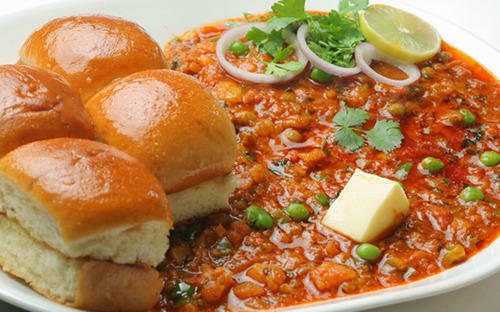 Pav Bhaji - a spicy curry of mixed vegetable cooking in special blend of spices and served it with soft buttered pav (bread bun shallow fried in butter),is any Indian food lover dreams. Step 1 : Take all the vegetables listed in the ingredients. wash them in running water and cut them into small Pisces. Step 2 : Transfer all veggies in 2/3 litter capacity pressure cooker.Add 1/2 cup water and Salt to taste.Close the pressure cooker with a lid and cook over medium flame for 2 whistle.Open the lid after pressure cooker releases naturally, it will take 5/7 minutes. Step 3 : While the veggie cooks, we will peel the potatoes and chop the tomatoes and capsicum. We have peeled the potatoes Now we will chop tomatoes. If you see lots of seeds in tomatoes then you can remove them. Discard the seeds of capsicum and chop them finely. Here we have chopped the capsicum also. Let’s check the veggies. Cauliflower and peas are soft now. These are completely boiled. Now, we will make pav bhaji. Take the vessel off the flame. Step 4 : Heat a pan. Pan is now heated . Add 2 tbsp of butter to it. Let the butter melt. Add 1 tsp ginger paste and add chopped onion. Roast them for a while. add chopped capsicum and tomato,salt.saute until tomatoes and capsicum soft. Step 5 : Add 1 tablesppon chilly powder 1 tsp,1/4 turmeric powder,1 teaspoon cumin coriander powder and 1 teaspoon readymade pav bhaji masala.stir and cook for a minute. Step 6 : Add 3/4 cup water mix well and cook for 2/3 minutes. Step 7 : Add boilde and mashed veggies and add 1 teaspoon Lemon juice. mix well and cook for 4/5 minutes.add salt if required turn off flame.add coriander leaves. Bhaji is ready. Step 8 : Cut the pav buns horizantly into halves.Heat tawa over medium flame.add teaspon butter and add halved pav buns over it.shallow fry both sides untile brown spots appear. it will take 30 sec take each side to take brown.transfer to plate. Finally : Pav Bhaji is ready.serve it to your family with your love i am sure they will really enjoy it lot.